Hall of Famer Bob Baffert hasn’t trained a Kentucky Derby winner since 2002. However, for those betting on the Kentucky Derby, he could have a top contender in this year’s Run for the Roses: Midnight Hawk. The colt has a unique ownership group as he is partly owned by reigning Stanley Cup champion Chicago Blackhawks coach Joel Quenneville, former Minnesota Vikings head coach Mike Tice (currently offensive line coach for the Atlanta Falcons) as well as John Sikura’s Hill ‘n’ Dale Equine Holdings, Mike Kitchen and Mike Pegram, who bred Midnight Hawk. Midnight Hawk also has a strong pedigree, a Kentucky-bred son of two-time Breeders’ Cup Sprint winner (2007 and ’08) Midnight Lute out of the grade 1-placed Wolf Power mare Miss Wineshine. Midnight Lute, also raced by Pegram, was the son of Real Quiet, who won the 1999 Kentucky Derby and Preakness Stakes before finishing second at the Belmont Stakes to Victory Gallop, who had been second to Real Quiet in the first two legs of the Triple Crown. Midnight Hawk is fairly new among the Kentucky Derby contenders. He won his debut by 6 1/4 lengths in December on the synthetic track of the now-closed Hollywood Park. The gray colt really gained notice in January with a win at the one-mile Grade 3 Sham Stakes at Santa Anita Park. Only four horses were in that field. Midnight Hawk, with Mike Smith up, went off as a 2-5 favorite. Midnight Hawk pulled away with a good outside run off the final turn to beat second-choice Kristo by 1 3/4 lengths. Midnight Hawk ran a mile in 1:36.48 and paid $2.80 and $2.10 – the field was depleted due to scratches by Life Is a Joy and Top Fortitute. 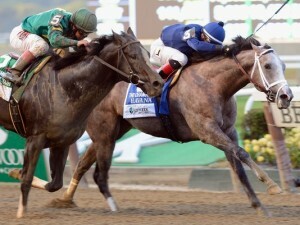 The win earned Midnight Hawk 10 points in the Kentucky Derby points system. ”He had to win this one,” said Baffert, who chose to run Midnight Hawk without blinkers for the first time. “Otherwise I would have been down on him.” The trainer added he believed the crowd noise affected his horse and led to a sluggish start. Keep in mind for your Kentucky Derby betting strategies that Baffert might stuff cotton in the horse’s ears going forward to dampen the noise. Midnight Hawk faced his toughest field yet in February’s Grade 2 Robert B. Lewis Stakes, over 1 1/16 miles at San Anita. The more experienced Candy Boy won that race, with Midnight Hawk finishing third, earning two points in the Kentucky Derby standings. Midnight Hawk was in good position on the outside in the stretch run but ran out of gas in the final sixteenth of a mile. That has been one question about this horse in that it may not be able to handle the distance and could be a sprinter like Midnight Lute. In the most recent Pool 2 Kentucky Derby odds, Midnight Hawk was 19-1. That number could rise in the next release following the Lewis Stakes.